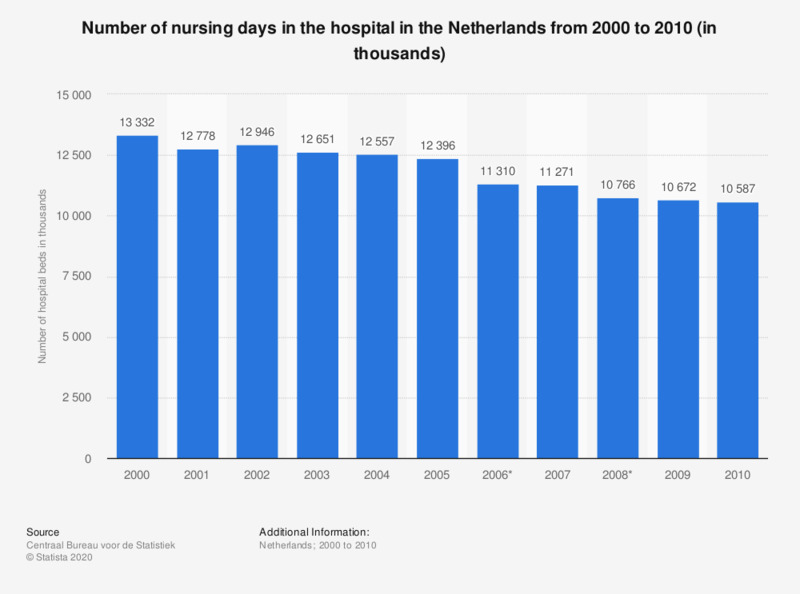 This statistic displays the number of nursing days in the hospital in the Netherlands from 2000 to 2010. It shows that between 2000 and 2010, the number of nursing days decreased from 13.3 to 10.6 million nursing days roughly. According to the source, the number of nursing days includes the admission day and the day of discharge. This also includes absence days (up to three, excluding the days following pre-operative screening). The statistic includes the nursing days in special units, such as intensive care. If the patient is admitted after 20.00 o'clock on the first day, it is not included. If the patient is admitted and leaves or dies the same day or when the patient leaves against the advice of the doctor, the day is counted as a nursing day. Moreover the source notes that from 2006 onwards, psychiatric ward nursing days in general hospitals are no longer included and from 2008 on, the figures also exclude nursing days at the psychiatric ward of university hospitals.